Before The Spectacular Now, I wondered whether I’d ever want to see another film about adolescence, but director James Ponsoldt’s addition to the genre qualifies as a remarkable achievement, a movie full of real feelings and real problems — in short, a film about young people that refuses to pander. Adapted from a novel by Tim Tharp, The Spectacular Now reflects Ponsoldt’s desire to find a bit of truth in a genre that doesn’t always value honesty. Immersion in the present is well and good, but it’s pretty clear that Sutter might be on the verge of throwing his life away. College? No. A future? Why bother? We know that Sutter’s spectacular present eventually will give way to the mediocrity that often results from squandered potential. How long will it take before the flask Sutter carries ceases to be a sign of rebellion and becomes a badge of dishonor? Sutter is smart, amusing and glib in ways that can seem off-putting at first, as if Teller has been instructed to do a Vince Vaughn imitation. Don’t give up on the kid, though; as the story progresses, he reveals depths that go beyond the surface of his clever retorts. He begins to question his views, in part because he forms relationship with Aimee (Shallene Woodley), a classmate who’s not at the center of high-school party life and who’s a bit more substantial than the girl (Brie Larson) who dumps Sutter in the movie’s early going, although she’s no ditz, either. Aimee and Sutter meet in an early morning scene in which Sutter awakens on Aimee’s lawn. Drunk as usual, he forgot where he left his car. An exchange develops: Sutter asks Aimee to help him learn geometry; he basically schools her in how to have a better time in high school. Lurking in the background is Sutter’s father (Kyle Chandler), a heavy drinker who Sutter hasn’t seen in years. His mother won’t even tell Sutter where his dad lives. When he learns his father’s whereabouts from his sister (Mary Elizabeth Winstead), Sutter decides to visit. Dad, we soon learn, is a preview of coming attractions for what Sutter easily could become, an irresponsible jerk. Spectacular Now provides Teller with a breakthrough role. Woodley — familiar as George Clooney’s teen-age daughter in The Descendants — continues to impress. 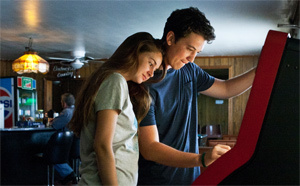 Shot in Athens, Georgia — where Ponsoldt grew up, The Spectacular Now is more than a good teen movie; it’s a good movie, a look at characters we come to care about right up until the film’s mildly ambiguous conclusion.